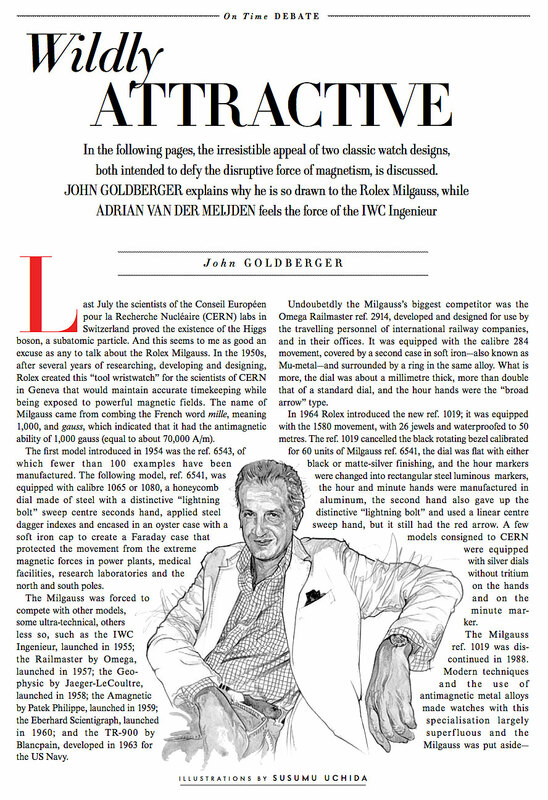 My good pal, John Golberger, who lives in Italy, wrote this article for Vanity Fair, where he discusses the appeal of the Rolex Milgauss. John Goldberger is the author of many amazing horological books, including 100 Superlative Rolex Watches. 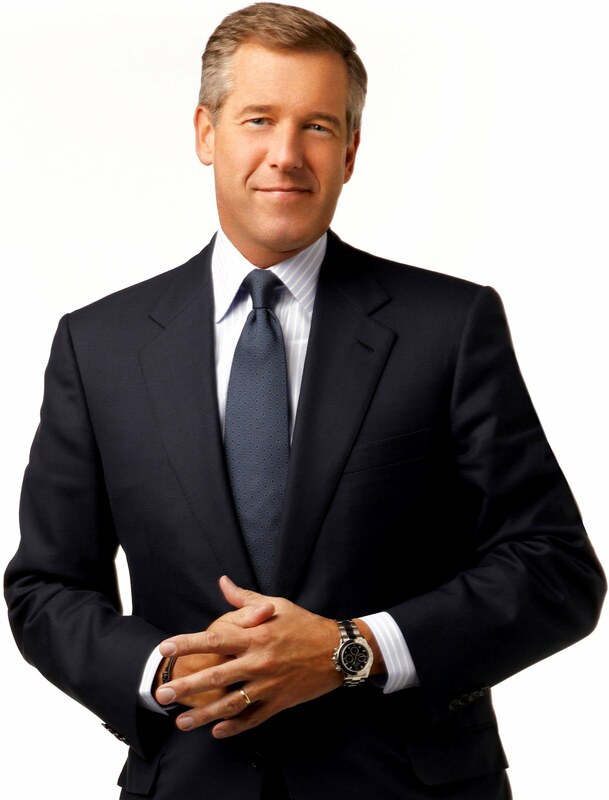 Brain Williams has been the NBC Nightly News Anchor since 2004, and he has been a big Rolex fan for a long time. 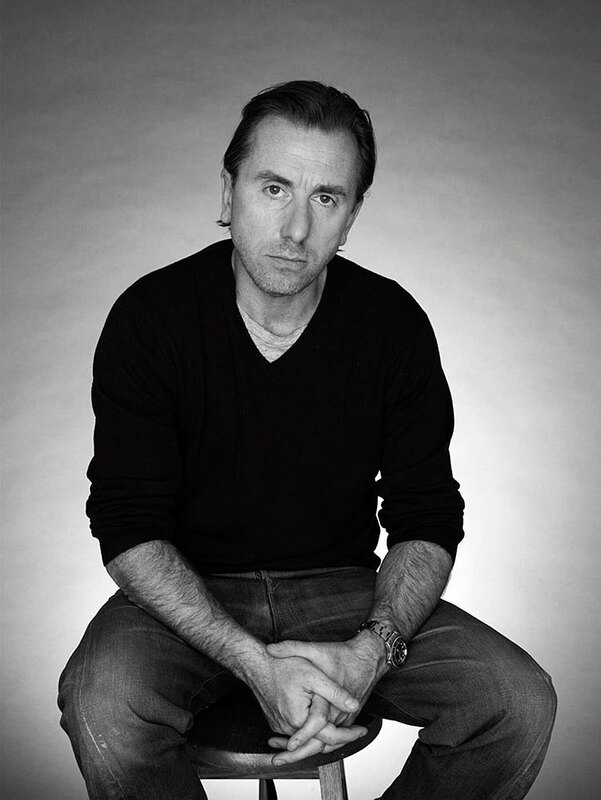 In the photo below taken by Matthais Clamer he is wearing a no-date Rolex Submariner. 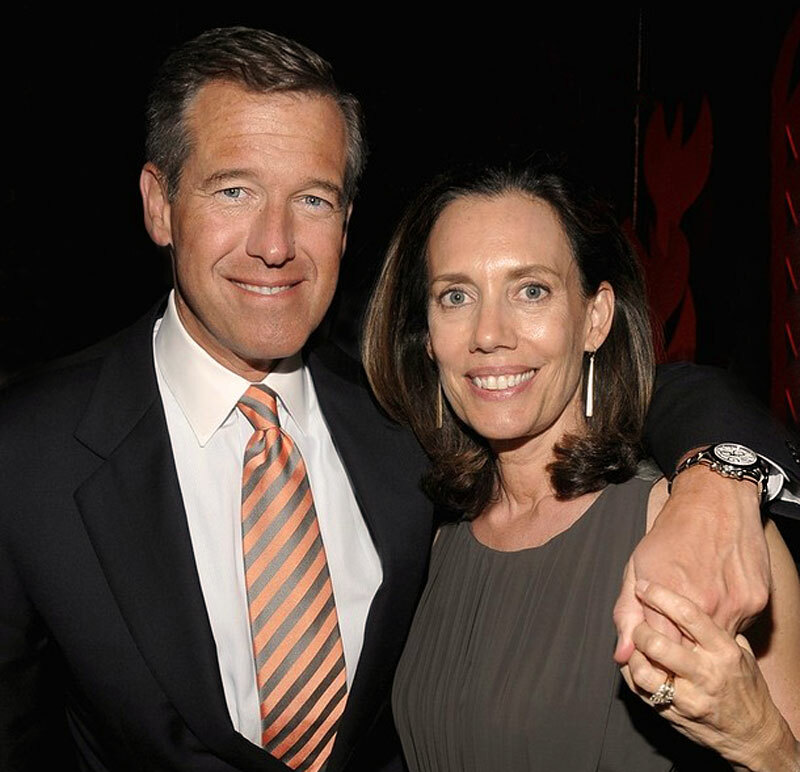 Brain Williams is extremely respected by viewers and a prominent observer dubbed him as "the Walter Cronkite of the 21st century." 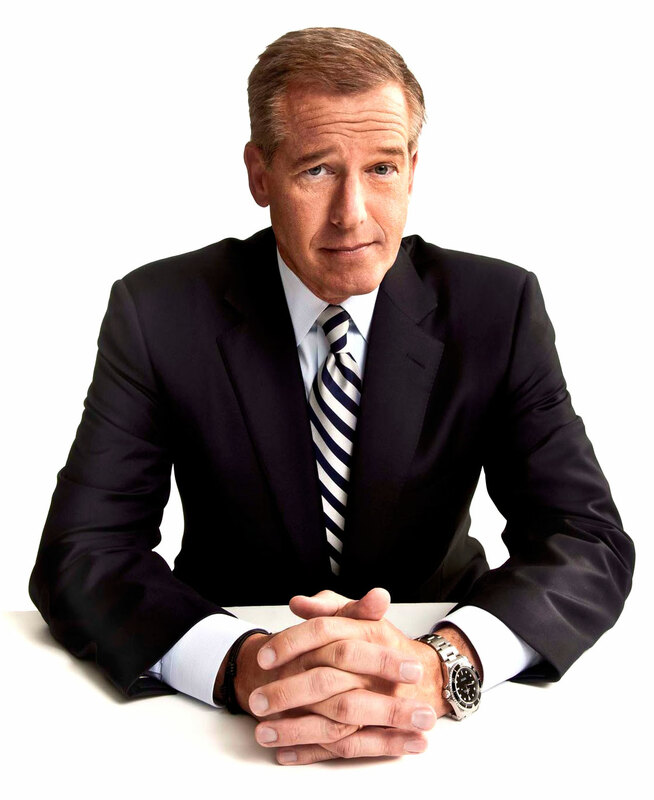 In these next images, Brian Williams is sporting a stainless steel Rolex Daytona with a black dial as well as one with a white dial. 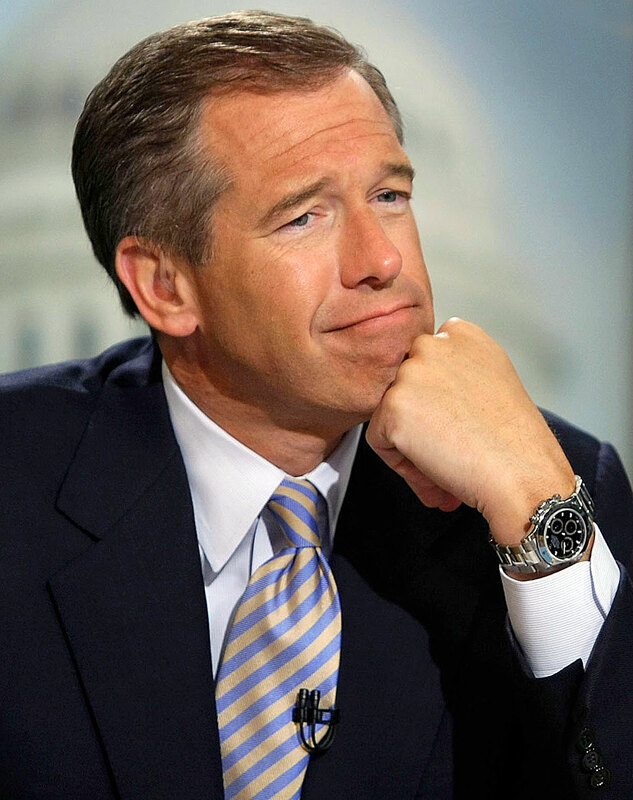 In the next image, Brain Williams is wearing a white dial Rolex Daytona. 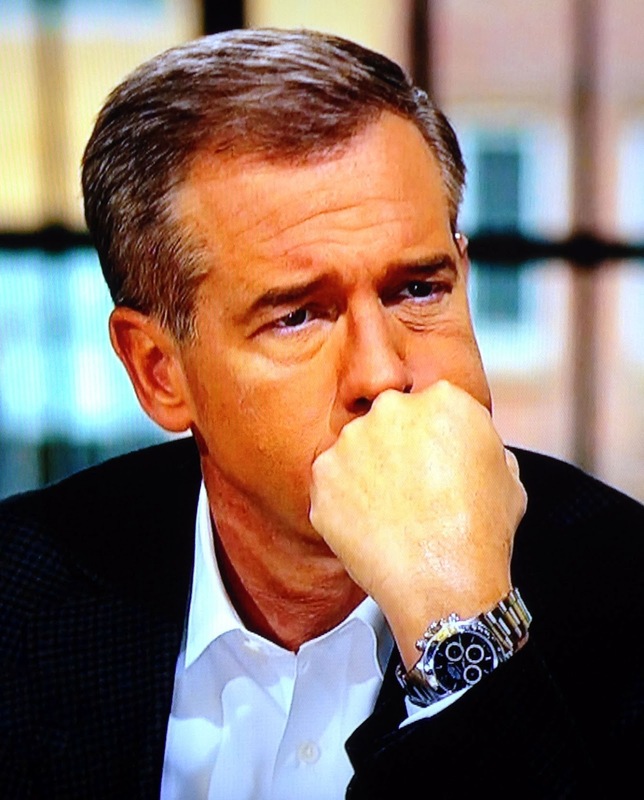 In this next image we see Brain Williams wearing his rose gold Rolex Daytona. 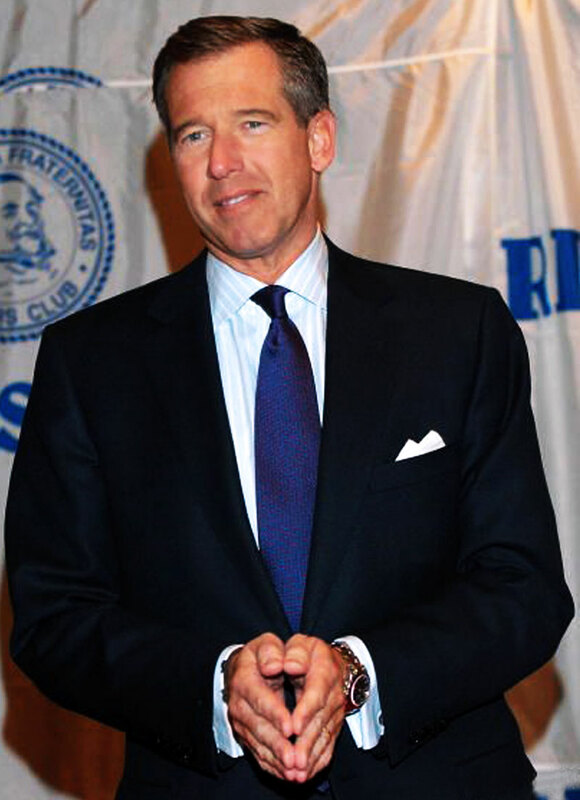 In the next two photos, Brian Williams is wearing a Stainless Steel Rolex Datejust with the Jubilee bracelet, as well as a Stainless Rolex GMT with a Coke bezel. 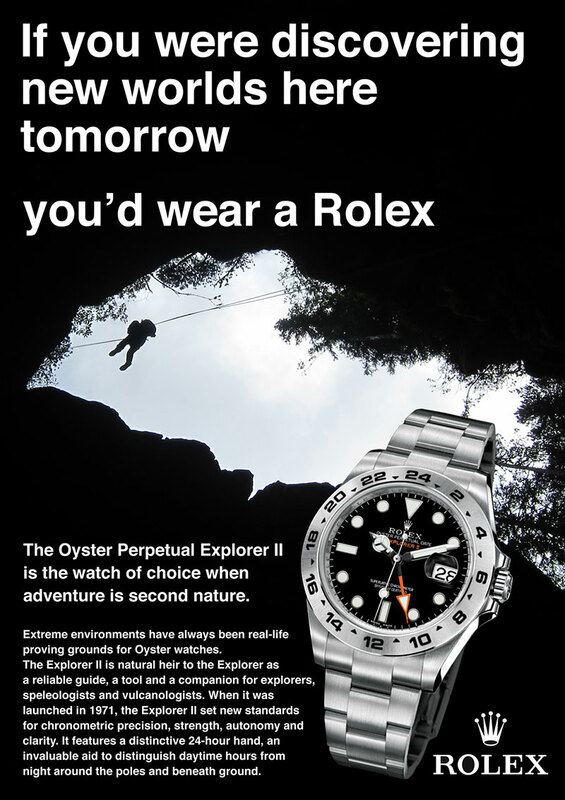 Was tinkering around in Photoshop and in homage to the Rolex Ad's of old, created this. Thought it looked pretty cool and maybe something you may post for me on your sight. Fantastic Website by the way. I visit each day to get my fix. "Why don't we have a contest on Jake's Rolex World, where readers can submit their artwork, along with a description of their concept, and you and I can be the judges of the contest? Let's do it just for fun!" Mark loved the idea, and sent in the next two images, which are based upon the "If you were" Rolex ad series from the 1970s." 1. You can submit as many pieces of artwork as you wish. 2. The artwork needs to be high-resolution, and it should be 1600 pixels tall. 3. Artwork and Copy MUST be in excellent taste. 4. Email artwork with your first and last name, and country you are located in. You are welcome to include a written narrative that describes the inspiration for your ad, but it is not required. 5. Contest begins today (May 20, 2013) and runs for 30 days, until June 20, 2013. Please send your entry via email to: Jake@RolexMagazine.com. This contest is sponsored by Jake's Rolex World and is not affiliated or sponsored in any way by Rolex. 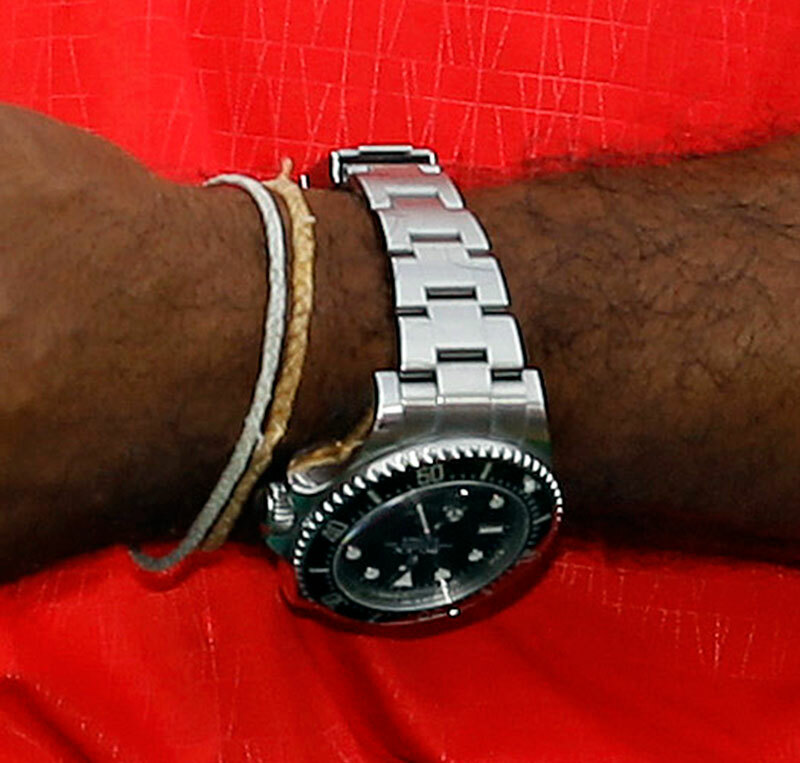 Who knows, perhaps Rolex or its ad agency might get inspired by what they see here? I will publish all the ads submitted, along with our awards for best ads sometime after the competition ends. The next ad is was also designed by Mark Wright, and is really cool!!! 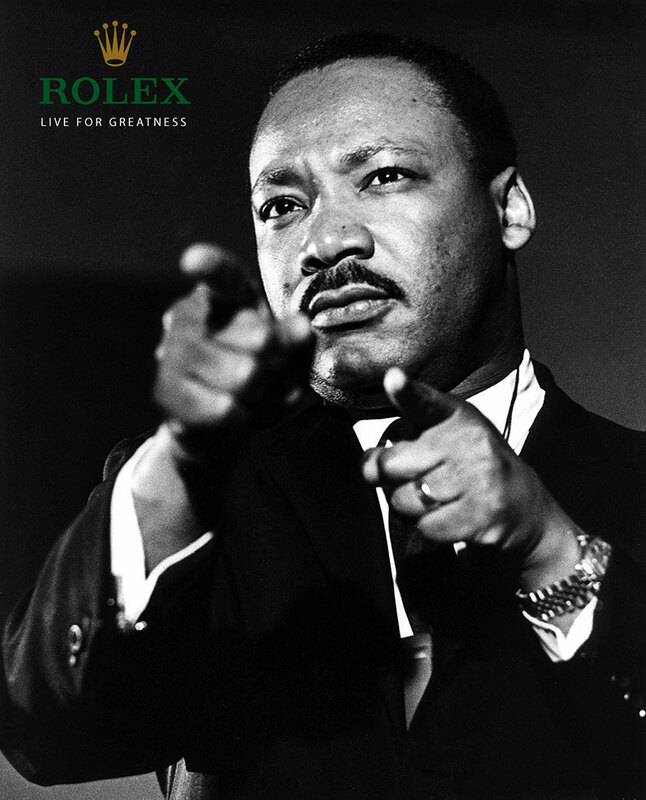 As I have said in the past, I believe that Dr. Martin Luther King is the greatest hero that ever wore a Rolex, and if I was Rolex, I would not only have magazine ads the feature Dr. King, but also billboard ads. I really like the Dr. Martin Luther King Ads above and below. 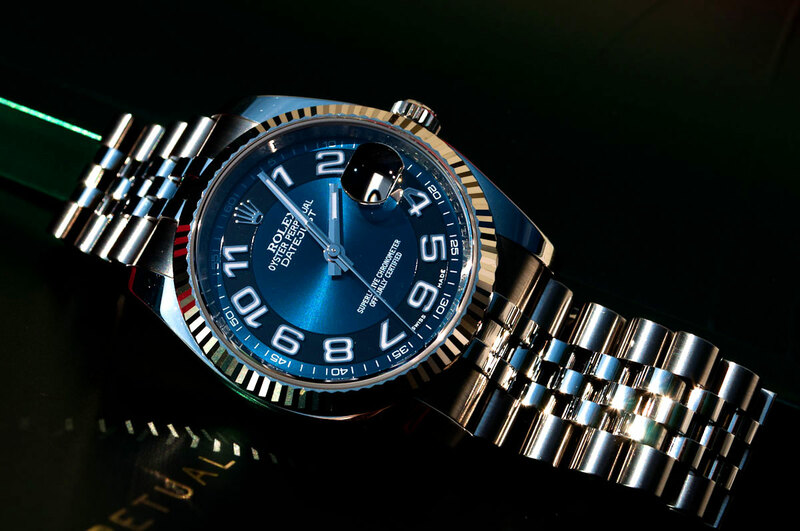 The are very similar, but the one above is deeply profound because it has one of Rolex's very famous tag lines from the 1950s and 1960s, that reads "Men Who Guide The Destines Of The World Wear Rolex Watches." Ironically Rolex used this tagline during the years Dr. Martin Luther King actually guided the destiny of the world, while Dr. King wore his trademark yellow gold Roles Datejust on his wrist, but Rolex never would have put Dr. King in an ad or referred to him in the 1950s and 1960s, because the times were way too turbulent. Rolex has changed so much since they had the "Men Who Guide" tagline. In other words, Rolex was still trying to prove itself in the 1950s and 1960s, but today they would NEVER use that tagline because they have already proven themselves, and if Rolex used that tagline today, everybody would think they were nuts. The beauty of the way I used it, is I am using it as a historical statement. The U.S. has a black president today, because civil rights leader like Dr. King, stood up for what they believed in, and Dr. King obviously risked and lost his life doing so, with his Rolex on his wrist, I might ad. This one speaks for itself! Pablo Picasso is obviously the greatest modern artist of the 20th Century, and I love this photo because his Rolex GMT Master is highly visible, and the photo almost looks like it was taken yesterday. 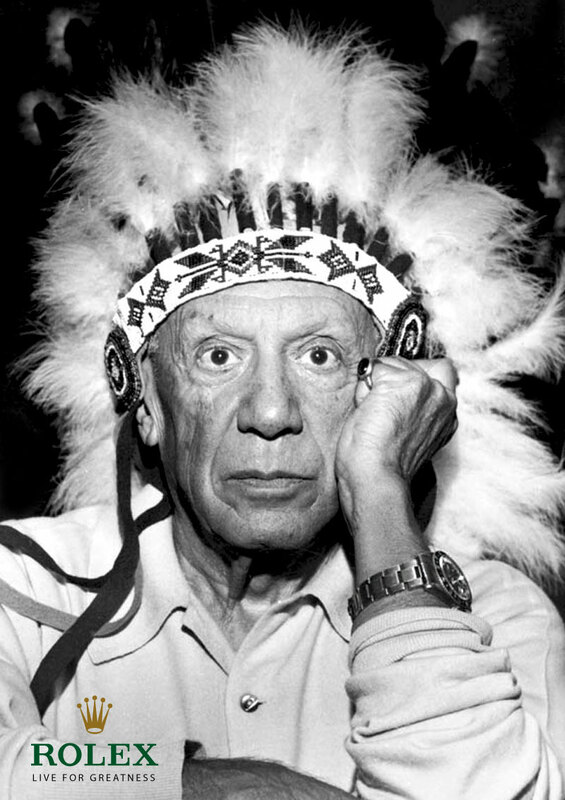 I remember, years ago, when I first saw and published this image, thinking how much Pablo Picasso looks like an American Indian in the image!!! The image is tres bizarre, and that is why I love it. Paul Newman was one of the coolest guys to ever wear a Rolex, and a few models have been nicknamed as "Paul Newman Rolex Daytona" models. 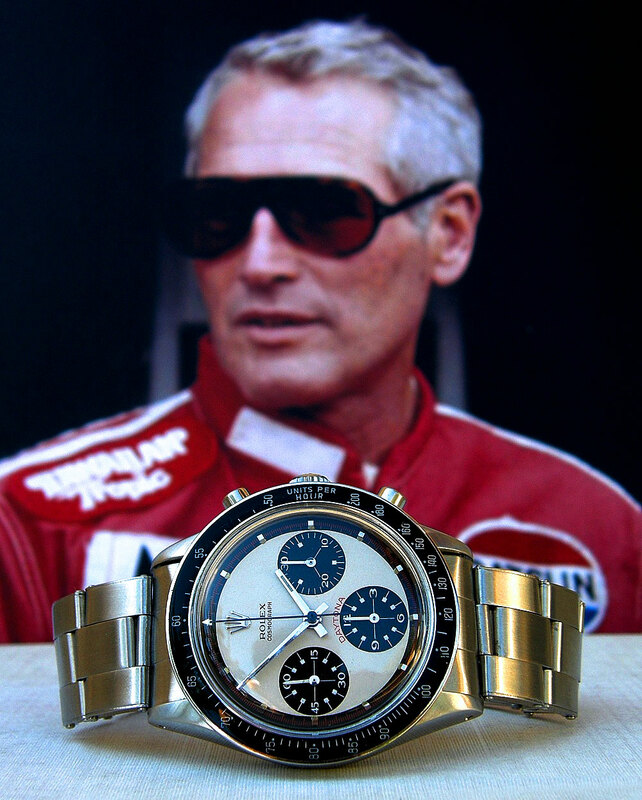 I think Rolex should bring back the white exotic dial Daytona, identical to the one Paul Newman is wearing in the photo below, expect it should be completely updated, with a 42 or 44MM case. I also think Rolex should keep the dial very clean, and NOT print the "Officially Certified Swiss Chronometer" on the dial. 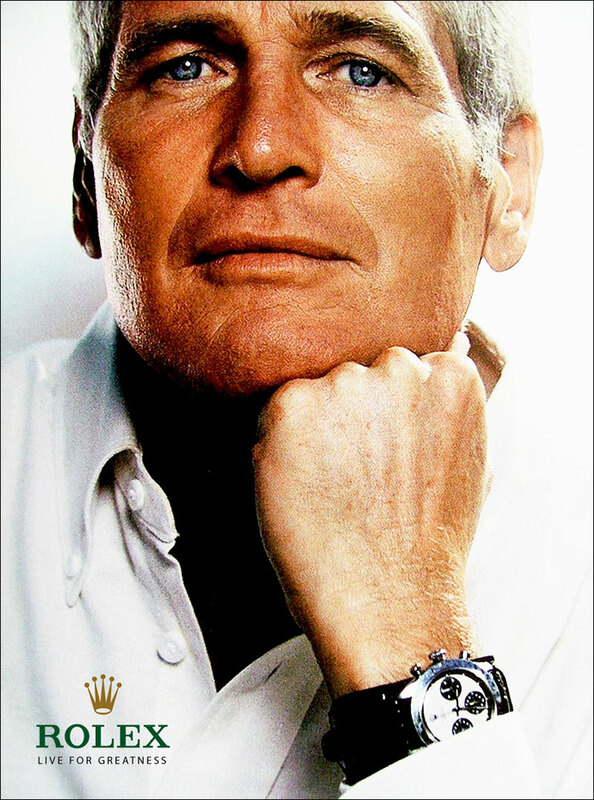 It should just say have the Rolex and Daytona designation on the dial like the original that Paul Newman is wearing in the ad below. 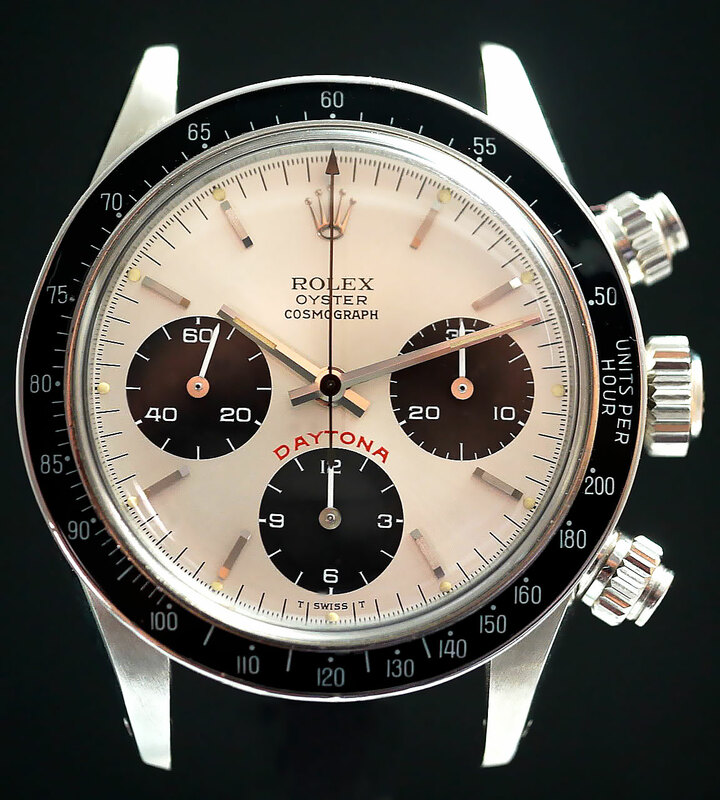 Further, I think Rolex should make this special edition watch and officially name it, The Paul Newman Daytona. 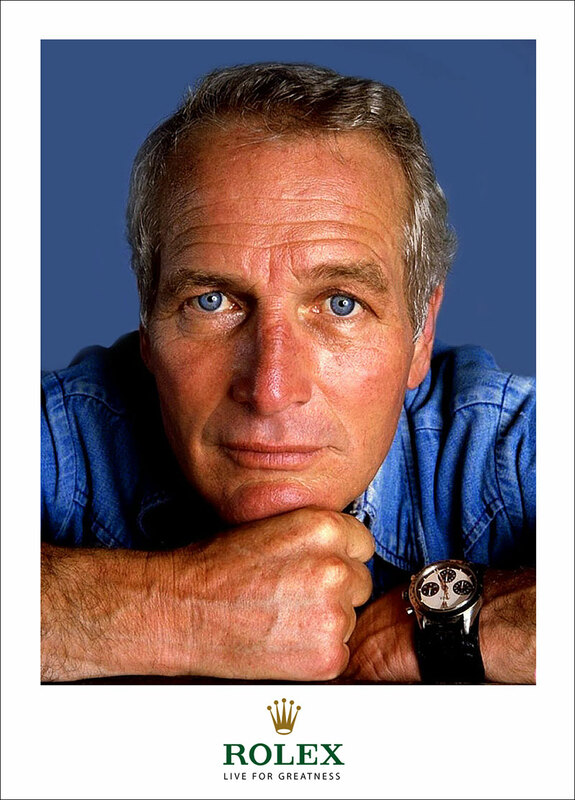 Rolex should put together a deal with Paul Newman's estate to license his name and image, and they should donate a portion from the sale of every "Paul Newman Rolex Daytona" to Paul Newman's Hole In The Wall Camp Charity Fund. 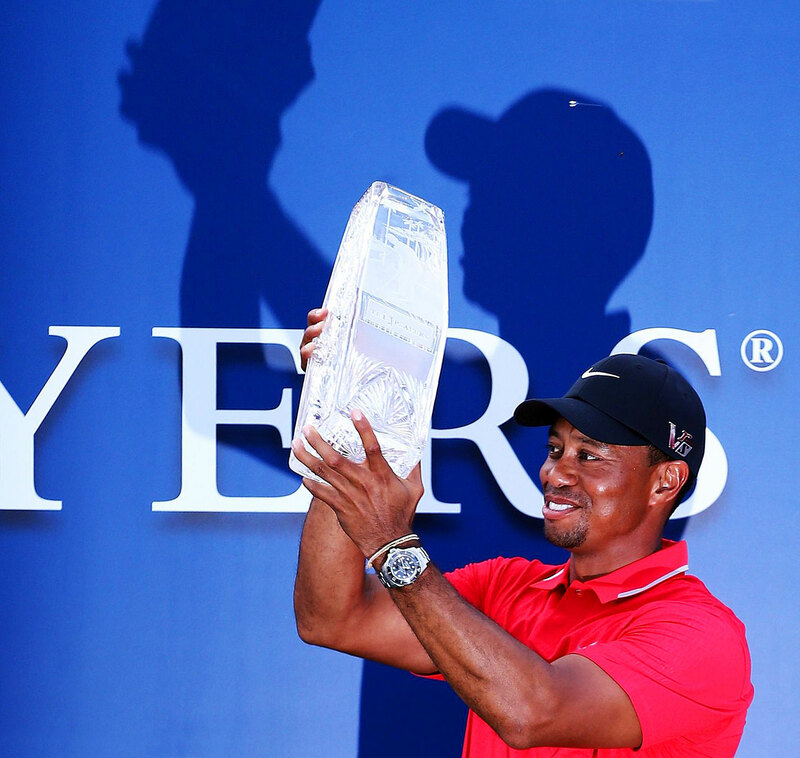 This way everybody wins, and it should NOT be a limited edition, just a special edition. You might notice that ALL my ads are very minimalistic, and lack the typical "For an official Rolex Jeweler Call 1-800-367-6539" as well as "www.Rolex.com", or any Trademark designation info. 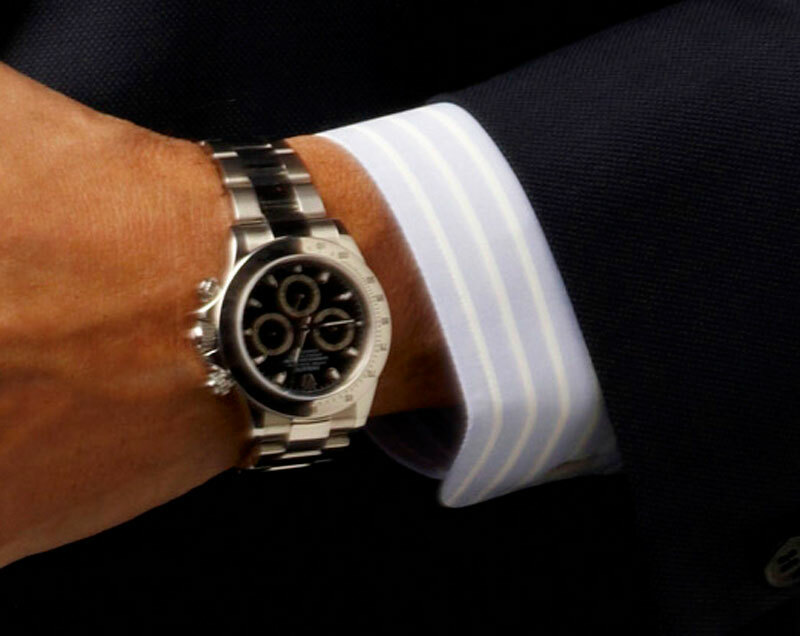 I did this on purpose because I think Rolex ads simply don't need it, and after all that is what Rolex.com is for. In other words, Less is More!!! I think Rolex should take more of an Apple/Minimalist approach to branding. I also think Rolex should make every watch they ever make in the future, a waterproof Oyster, and that way they don't need to put the Oyster designation on their dials. I think Rolex should keep the Oyster designation, and talk about it, but they don't need to put it on dials anymore. 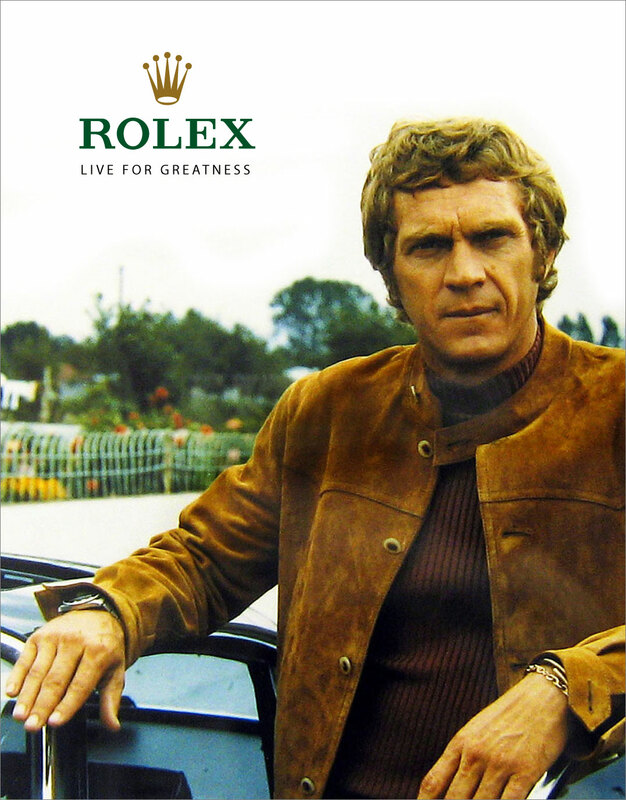 This one speaks for itself as Steve McQueen was the definite King of Cool, wearing his Rolex Submariner while posing in front of his green Porsche 911. If you want to see many examples of historical Rolex images to get inspiration, you can see hundreds of them by clicking here. Wow!!! I can't believe my eyes!!! 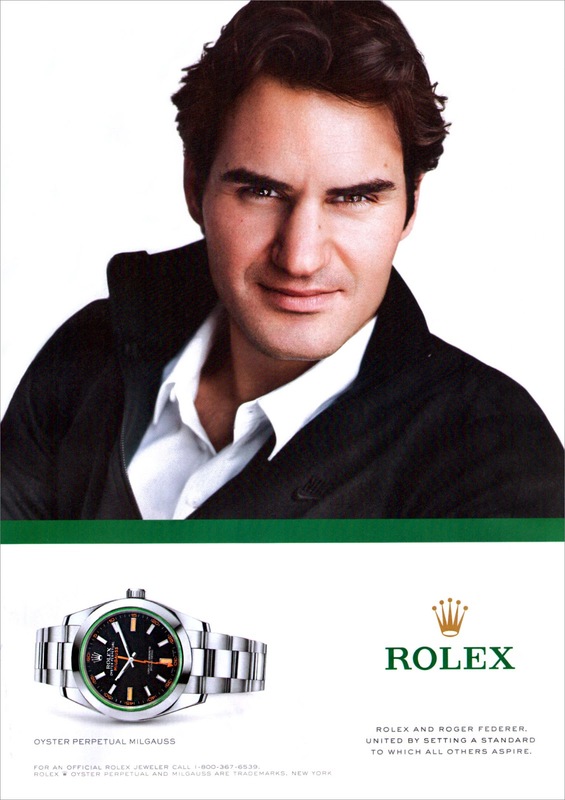 This is a seminal moment in Rolex advertising history!!! I recently wrote an article about how Rolex recently immersed themselves into their amazing history, with the recent complete overhaul of Rolex.com, and in particular, with adding a whole new Rolex history section. 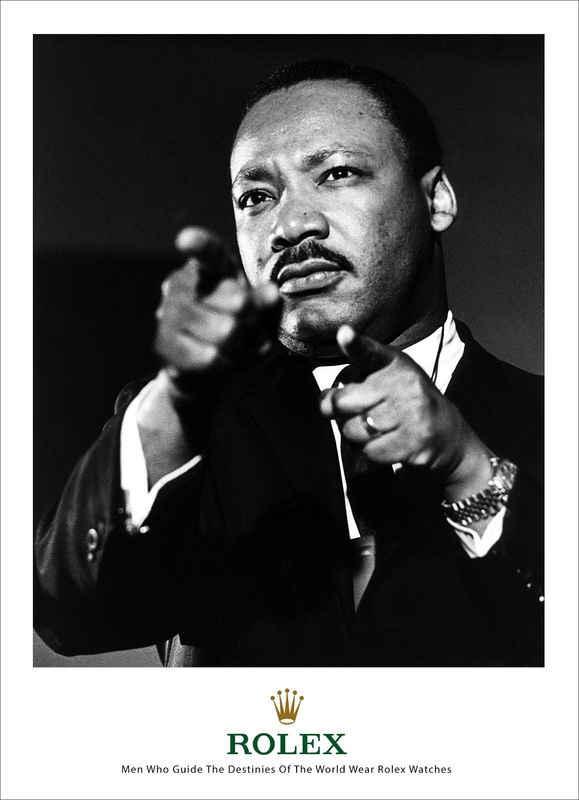 For years, I have been arguing Rolex should use images of Dr. Martin Luther King in modern Rolex ads, because I argue he is the greatest hero in Rolex history, so to finally see Dr. King in a Rolex ad brings tears to my eyes. All I can say is Bravo Rolex!!! Bravo!!! Pictured below from upper left to bottom right we see Tiger Woods, Elvis Presley, Pablo Picasso, Robert De Niro, U.S. President Dwight Eisenhower, Dr. Martin Luther King, Marlon Brando, Sir. Jackie Stewart, Sophia Loren, and Roger Federer. 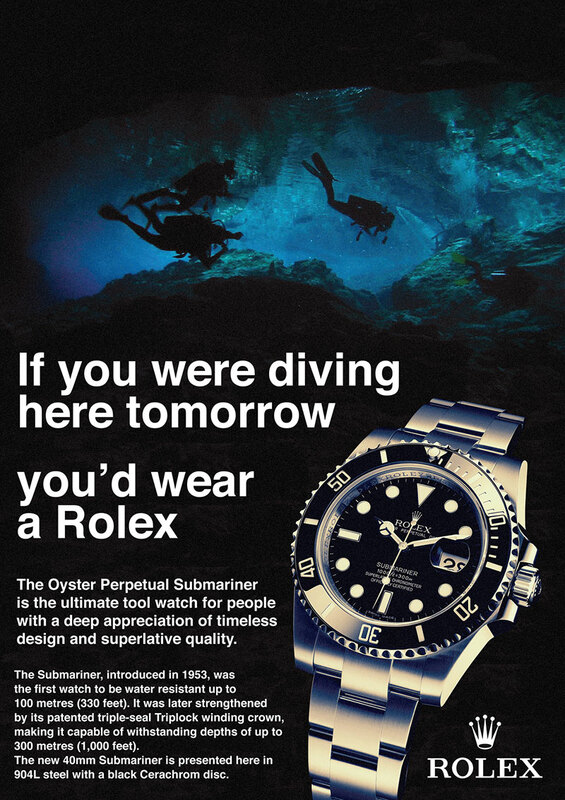 I love the copy in this all-new Rolex History ad. It is superbly written and precisely articulate. Especially the line that reads "IT'S DARED MEN FASTER. FURTHER." This is true, and it goes all the way back to Sir. Malcolm Campbell in the 1930s breaking one land-speed record after another, and continues up to Chuck Yeager breaking the speed of sound barrier in 1947. It continues with Sir Edmund Hillary, and Tenzing Norgay conquering Mount Everest in 1953, and Captain Don Walsh and Jacques Piccard setting the deepest dive history in 1960, up to the U.S. Astronaut and Air Force Pilot William "Pete" Knight setting the all-time speed record for level flight in 1967 in his venerable X15. This daring continued with the NASA Apollo Astronauts who went and walked on the moon with their Pepsi Rolex GMT-Master watches, and continues all the way up to last year when James Cameron returned to the Challenger Deep with Captain Don Walsh by his side. People can say whatever they want about Rolex, but one thing is for certain, Rolex history is unparalleled. Many, many men have pushed the envelope of what is possible, inspired by a Rolex on their wrist. 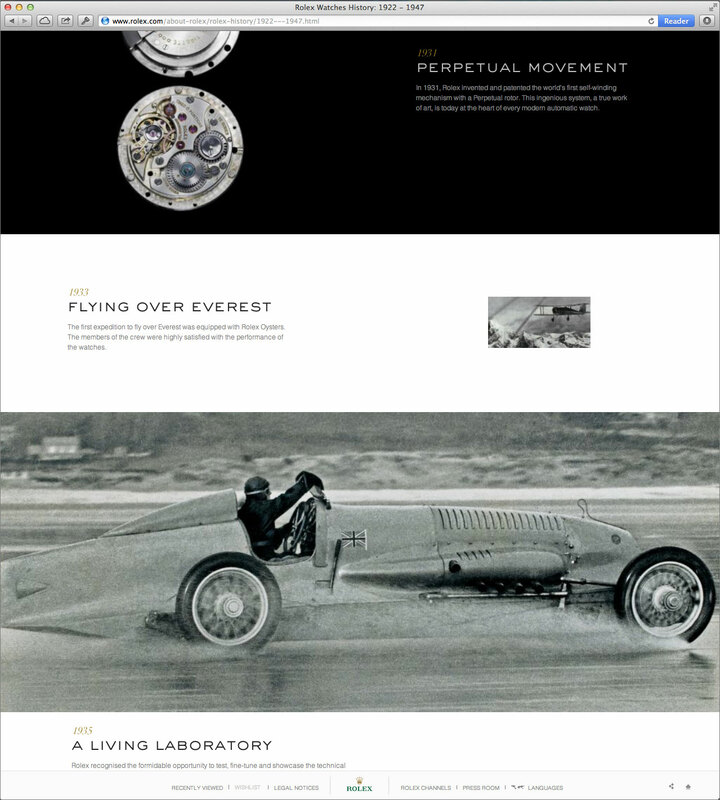 This amazing Spirit Of Inquiry is what has made Rolex the International Mark Of Success and Achievement. 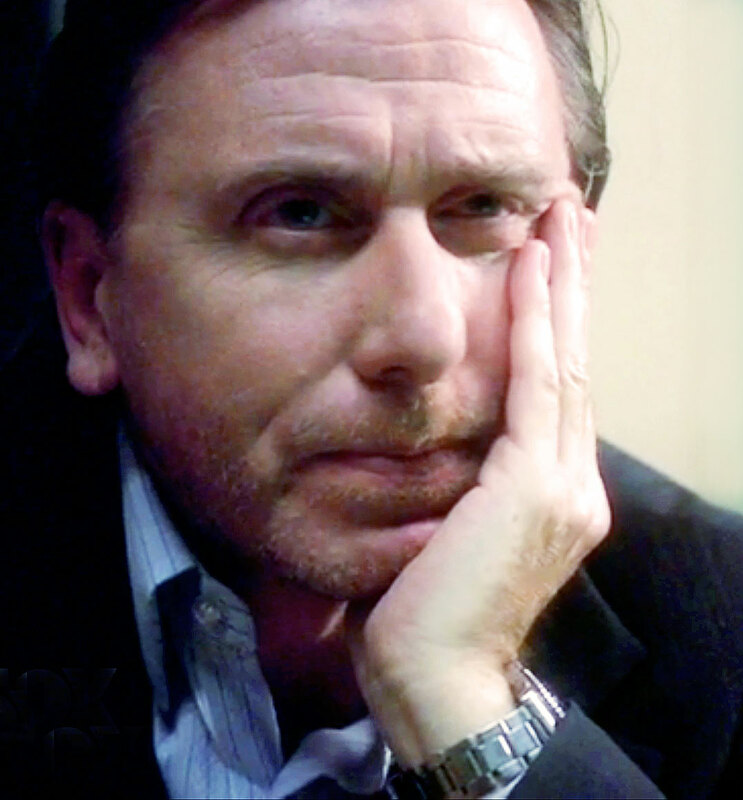 Tim Roth starred in the hit TV show "Lie To Me," which ran from 2009 to 2011, where he played "Dr. Cal Lightman," who wore a vintage Rolex Submariner, which I believe is a Reference 1680. 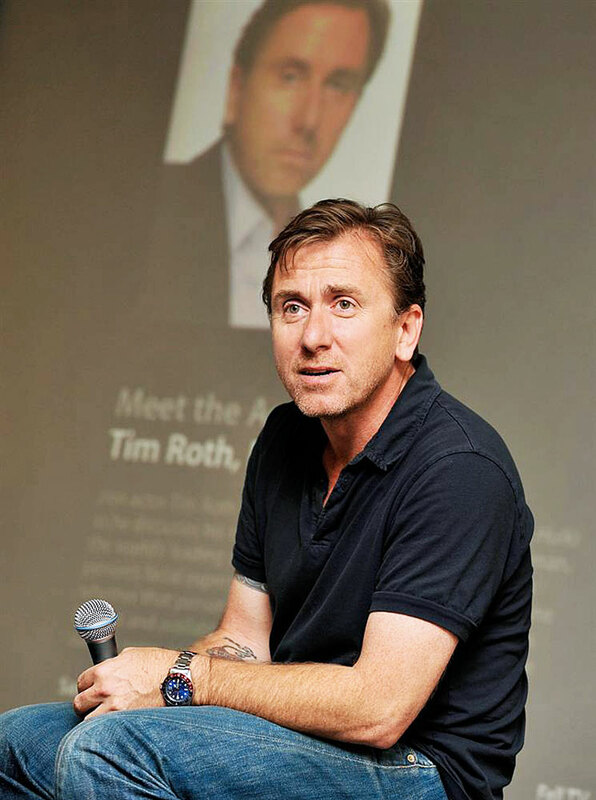 In the photo above we see Tim Sporting his vintage Rolex Pepsi GMT Master. 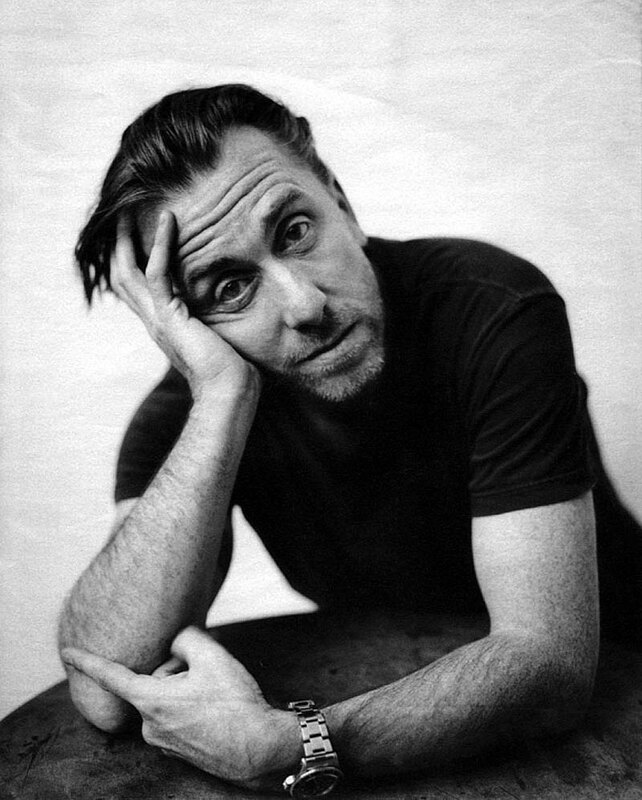 Tim Roth has also starred in many movies including Reservoir Dogs, Pulp Fiction, Planet of The Apes, The Incredible Hulk and Rob Roy. Jeff (Dr. Strong) created this amazing image of Paul Newman with a Paul Newman Exotic Dial Rolex Daytona in the foreground. What a great image Jeff!!!! If you aren't familiar with the Paul Newman Daytona, you can learn just about everything by checking out The Complete History Of The Paul Newman Daytona article I wrote. I love to surf around your site. 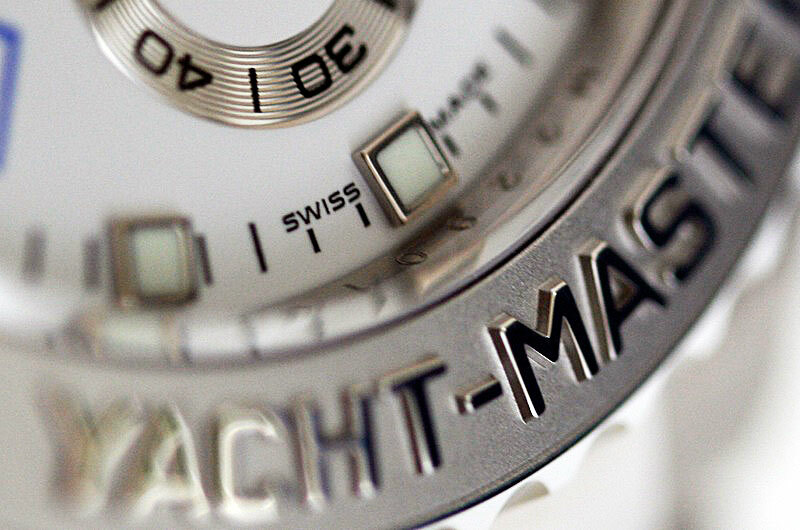 So much information, so much nice pics, so much nice watches - I love it. For a couple of weeks I have a new Datejust and I love it so much. The weather in Germany was so nice, I had to make some pics from my DJ. TO WHICH ALL OTHERS ASPIRE. Roger Federer is the greatest tennis player in history and I just saw this cool magazine ad in the June 2013 Vanity Fair. You have got to love the tagline. Like Dizzy Dean said, "It ain't braggin' if you can do it." 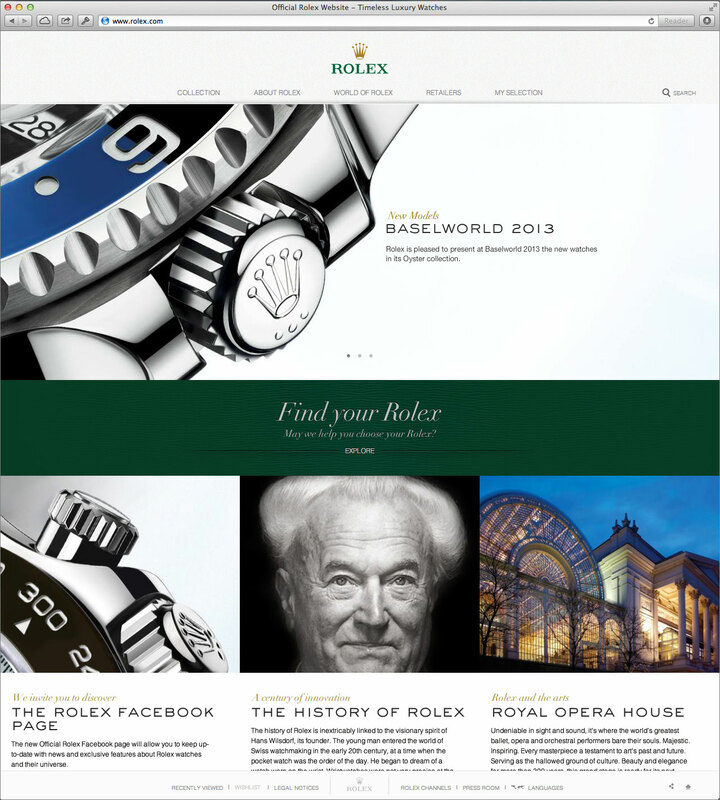 In my last post, I covered the amazing all-new Rolex.com website that Rolex launched at the beginning of BaselWorld. 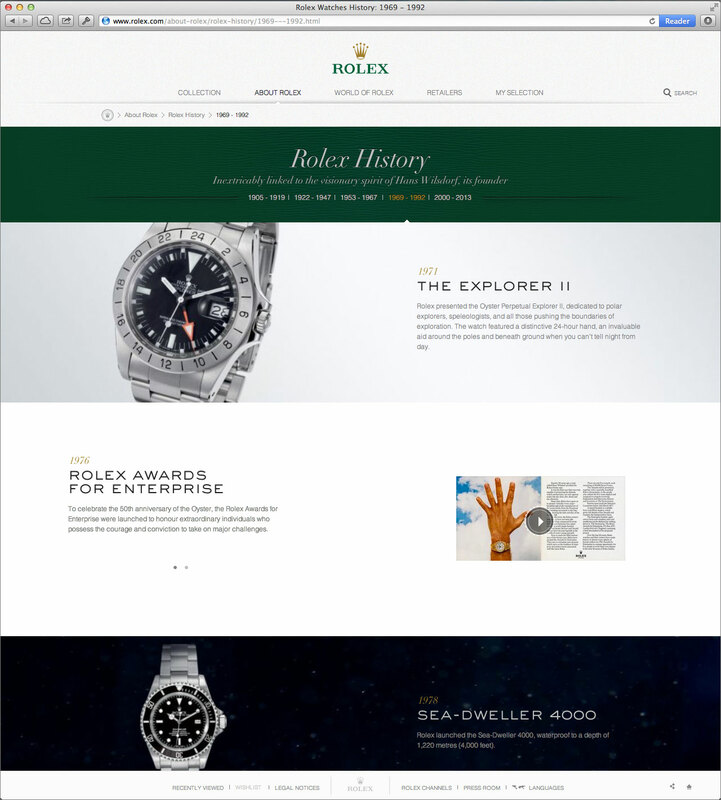 As I mentioned, the new Rolex.com is not a facelift, but a complete reinvention, and Rolex also launched a Facebook Page as well as a Rolex Pinterest page. Rolex also had a significant update on its Rolex YouTube Channel. 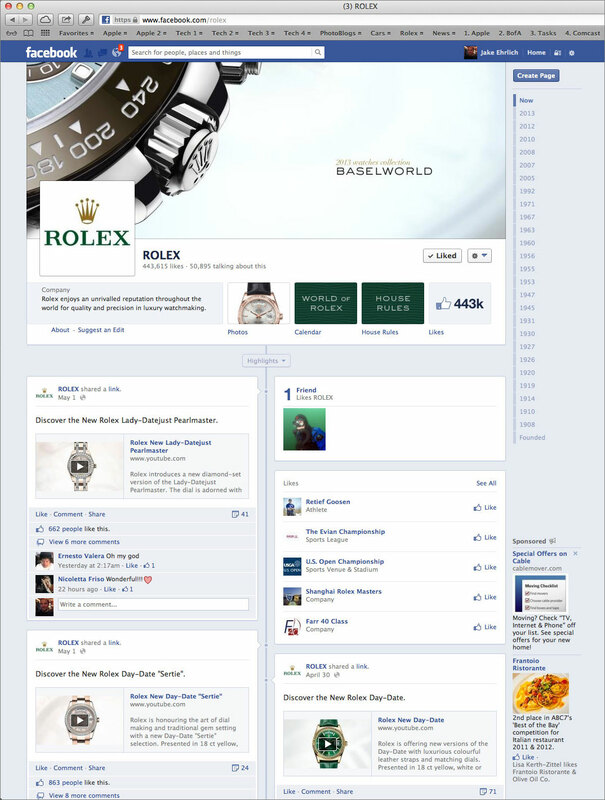 I think it is interesting Rolex chose to launch a Pinterest Page, but not a Twitter page. You can go directly to the Rolex Facebook page by simply clicking on "The Rolex Facebook Page" located in the bottom of the left hand corner on Rolex.com. It seems like in one fail swoop, Rolex completely reinvented its online presence which took them from the middle of the class straight to the front. First a little background. 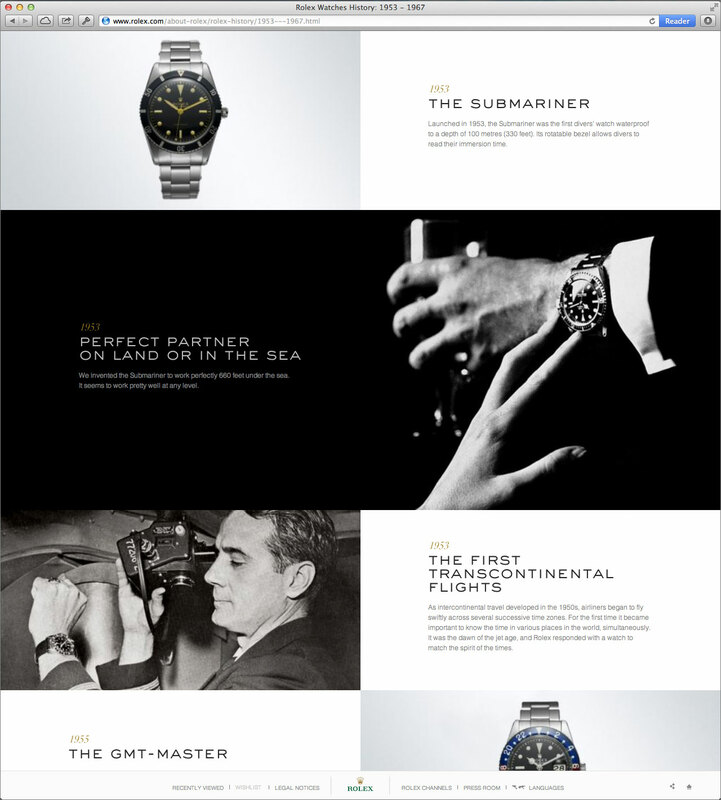 The last time Rolex completely overhauled Rolex.com was three years ago, in 2010, in commemoration of the 50th anniversary of the Bathyscaphe Trieste achieving the all-time ocean depth record in 1960. 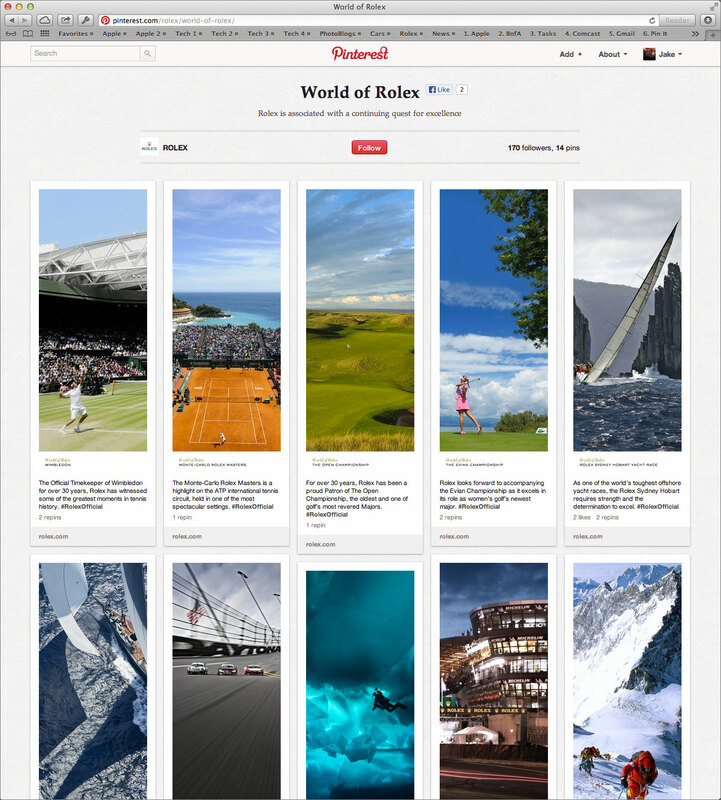 Prior to the 2010 overhaul of Rolex.com, the website left much to be desired and it's performance was bogged down by the significant overuse of Adobe Flash. There were no photos of vintage Rolex watches, and no photos of Rolex's innovative founder, Hans Wilsdorf, and no discussion of Rolex's amazing history. 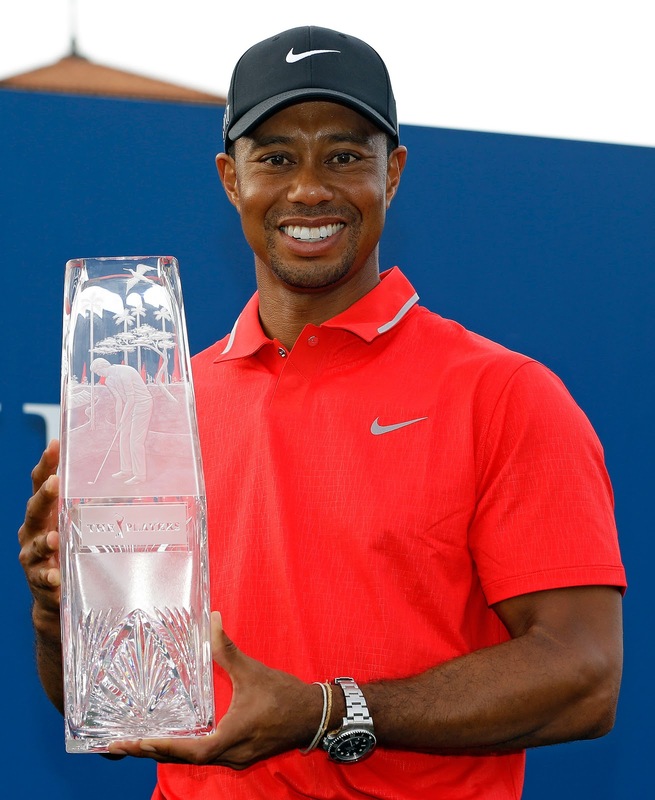 Personally, I did not like Rolex.com at that time and thought there was a tremendous amount of room for improvement. The 2010 overhaul of Rolex.com was fascinating because the whole website improved significantly, and all of a sudden it started to look like Jake's Rolex World, by adding a photo of Rolex's founder, Hans Wilsdorf, as well as photos of vintage Rolex watches. Unfortunately Rolex made a poor decision not to abandon the misuse/overuse of Adobe Flash, and Rolex.com offered a Flash, and a straight HTML version, which was confusing and did not make sense. In other words, the core-essence of Rolex watches are their intuitive simplicity, and ease of use, and none of the prior Rolex.com websites came anywhere near achieving this Zen-simple-like standard. 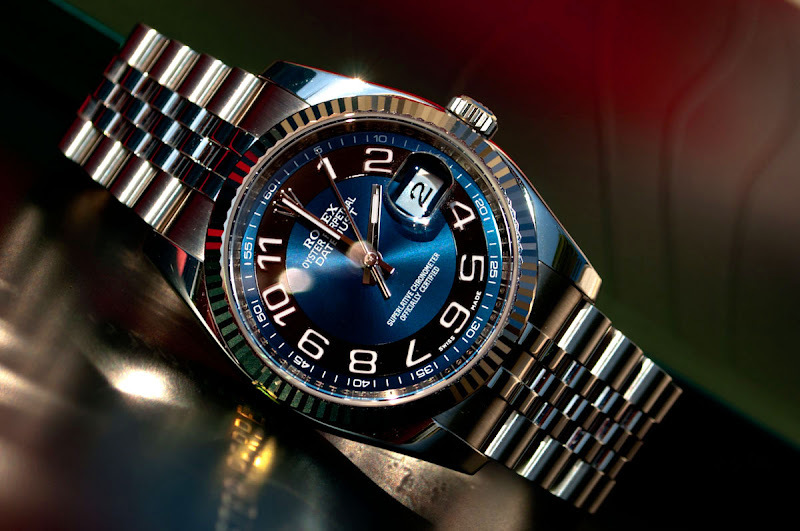 Last week, as BaselWorld 2013 began, without fanfare, Rolex quietly launched a complete overhaul of Rolex.com, and it is a stunning work of art!!! BaselWorld is where Rolex introduces and showcases it latest innovations, but this years greatest BaselWorld introduction did not take place in Switzerland, but internationally–all-over planet earth–with the introduction of the the all-new Rolex.com...and Adobe Flash is nowhere to be found on the freshly overhauled Rolex.com. Instead Adobe Flash has been thankfully replaced with HTML 5. The new UI (User-Interface) on Rolex.com has been intelligently simplified, and now offers only 5 top-level selections, and a simple, symmetrically placed Rolex crown logo. 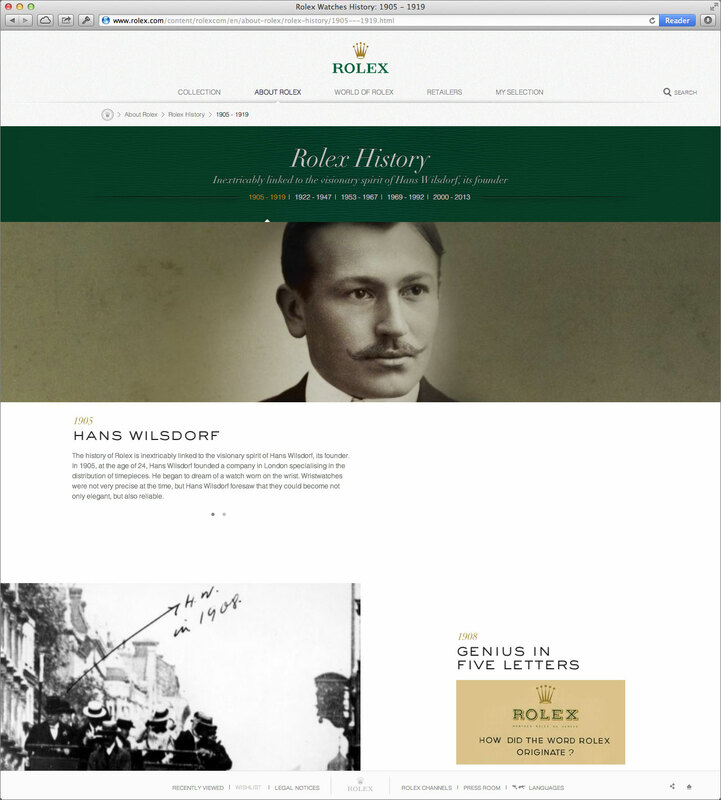 There is a huge all-new Rolex History section on Rolex.com which now appears, front and center when you first land on Rolex.com (at the bottom of the page) and it has a picture of Hans Wilsdorf, the founder of Rolex. 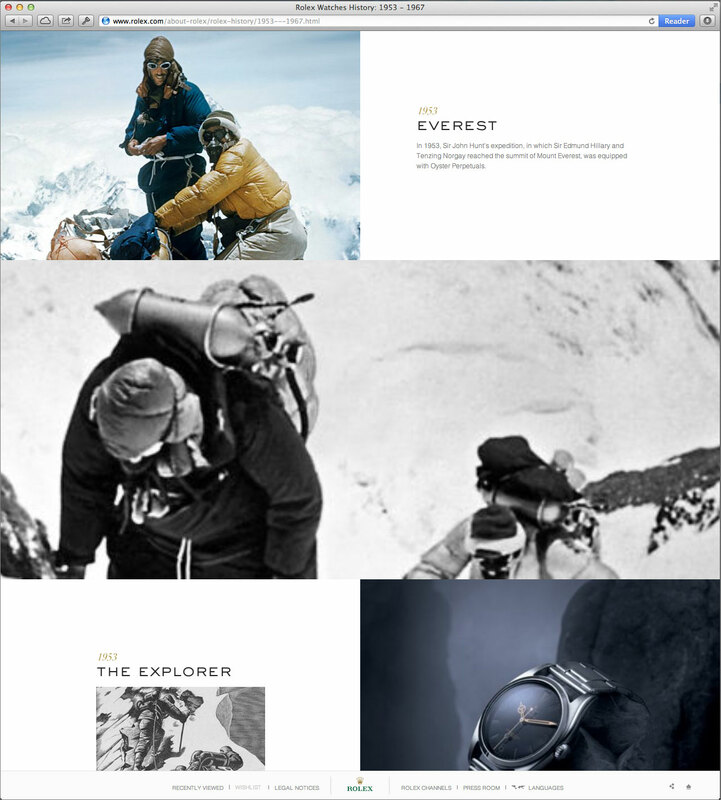 If you click on his image, you go to the Rolex History section pictured below, which features a 100+ years timeline, broken-up into 5 sections. The 5 section Rolex History section walks us through some of the greatest Rolex history achievements, which are fascinating. Years ago, after I had started Jake's Rolex World, I had a conversation with a then current leading Rolex executive, who I will not mention by name. I mentioned to him how deeply profound Rolex's history was, and he said to me, point-blank: "Rolex does not care about its history. Rolex only cares about selling watches." Of course, as the worlds leading Rolex historian, I was completely stunned and deeply disappointed to hear these words. 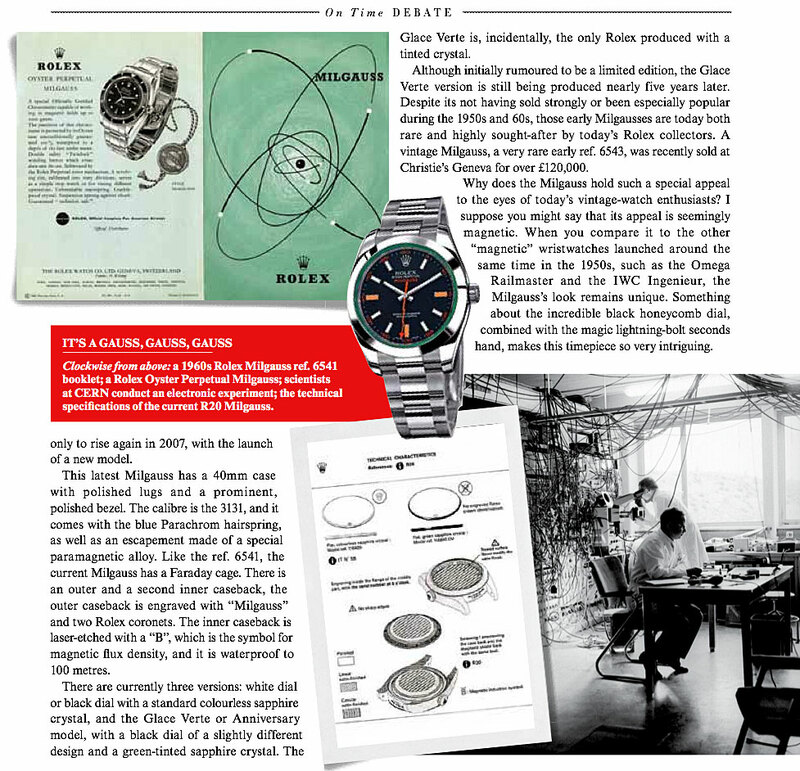 Another time, in 2010 I had a conversation with a different Rolex executive who said to me, "Rolex does not seem to know much about its own history, does it?" I responded by saying it sure appeared that way. He said he thought it was a shame, and I asked him why he thought Rolex was not into celebrating its rich history? He shook his head in disappointment and said he didn't know. We both kind of shook our heads in confusion and disappointment. 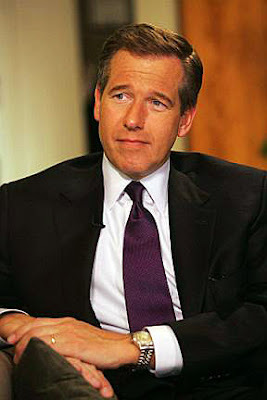 Then he said "I think it might have to do with the fact that after Hans Wilsdorf died, so many employees went to work for Rolex, served their time, so to speak, and then retired, and over the past 50 years since Hans Wilsdorf passed away, the brilliant Rolex history just kind of got lost in the daily shuffle of Rolex corporate life. I agree with his assessment, and as somebody once put it so eloquently, "History, does not seen like history when you are living through it." The Rolex executive then curiously asked me, "Why do you work so hard on Jake's Rolex World? 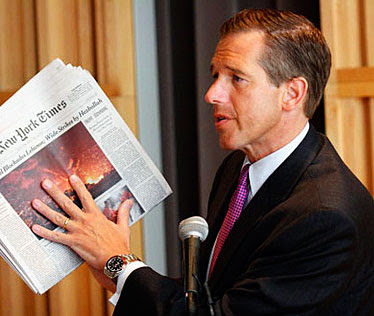 Clearly it is not for money, and as a fan and daily reader of Jake's Rolex World, I know how passionately you work to discover all this amazing history." I responded by saying "I have knocked myself out to discover and share all this amazing Rolex history, because I realize if I don't document it, in the not so distant future, it will become lost forever." I also mentioned that many of the men who achieved amazing feats in the 20th century with Rolex watches on their wrists were getting old and dying. I said "To my way of thinking, as somebody who loves Rolex, it would be a crime for me not to try to document as much of this amazing history as possible, and share it with the world. To not do so would be a crime against humanity, because so much of Rolex's incredible history is intertwined with the history of the 20th century. Take for example Sir Edmund Hillary, who just died last year." I can't emphasize this fact enough, that many of Rolex's amazing achievements during the 20th Century have been intertwined with many other great 20th Century achievements, many of which have not been completely documented. I know, because I am working on them. So I take my hat off to Rolex and sincerely congratulate them on this superb all-new beginning, and at the same time, I challenge Rolex to continue to dive much deeper into their profound history, and share it with the rest of the world on Rolex.com. 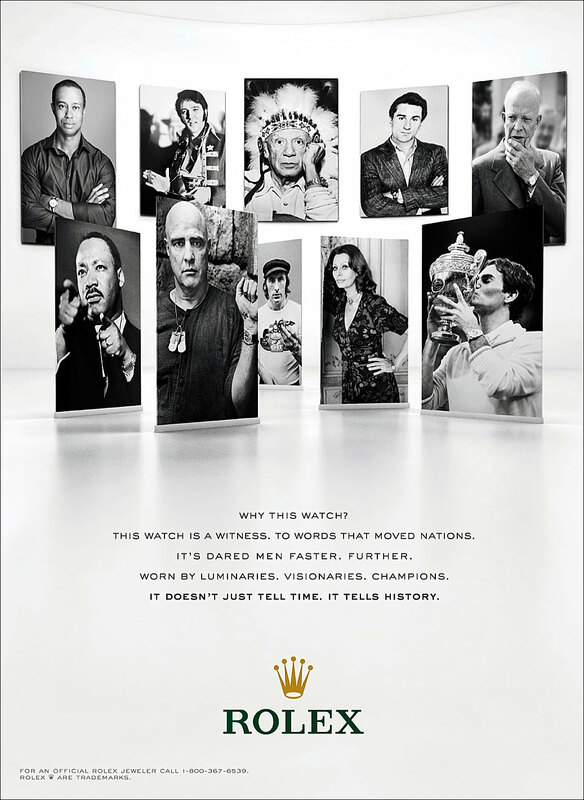 It is now evident that Rolex finally realizes the single most invaluable marketing asset they posses is their unparalleled history, and I hope in the years and decades to come that Rolex continues to expand the Rolex History section on Rolex.com. 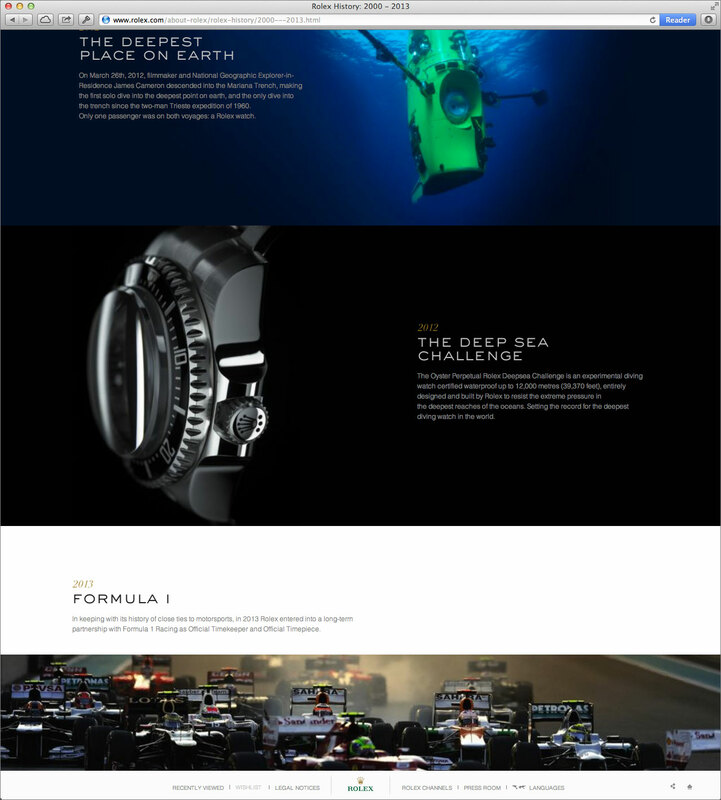 The new Rolex History section on Rolex.com is listed in chronological order, and the last page ends with James Cameron returning to the Mariana Trench with Don Walsh by his side, to return to the deepest known chasm on planet earth. I would like to point out I first fell madly in love with Rolex when I bought my first Rolex Submariner at age 16, which was thirty years ago. In my entire adult life, I never witnessed or lived through any significant Rolex history because there was not any to witness. This changed last year, when I witnessed and documented–in real time–James Cameron's descent into the Challenger Deep, and it was amazing!!! It is my fervent prayer, that Rolex continues on this path by supporting and showcasing many more adventures into the world of exploration and achievement. I sincerely believe and hope that Rolex's greatest history is ahead of them, not behind them, and I hope current Rolex leadership has the wisdom and knowledge to recognize and take real and meaningful action on this fact. I feel privileged to have had Jake's Rolex World play a defining role in bringing Rolex history to the forefront where it belongs. Once again, I say BRAVO!!! BRAVO!!! BRAVO!!! 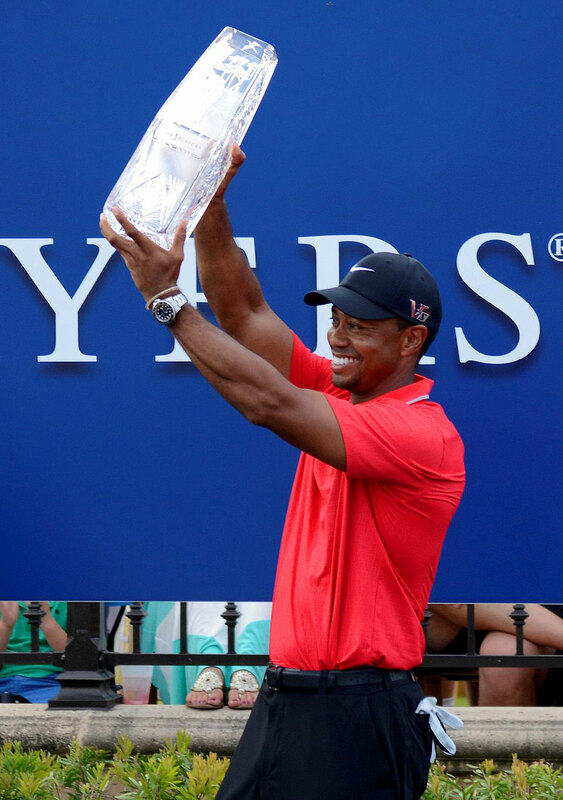 Congratulations Rolex!!!! I highly recommend you check spend some exploring the all-new Rolex.com.